Behind the Smoke breaks down Formula D and drifting for all of the newcomers out there. Daijiro is known to be quite superstitious. In this episode we take a closer look at Daijiro and his team’s superstitions to see if they are really connected to his success. We also asked several other professional Formula D drivers if they believe in following certain things to help the outcome of their performance. The biggest thing in motorsports is coming back to West Palm Beach! The national drifting series will be returning to the newly configured road course of Palm Beach International Raceway June 1 & 2 where cars will slide at speeds of over one hundred miles per hour – inches from concrete walls. 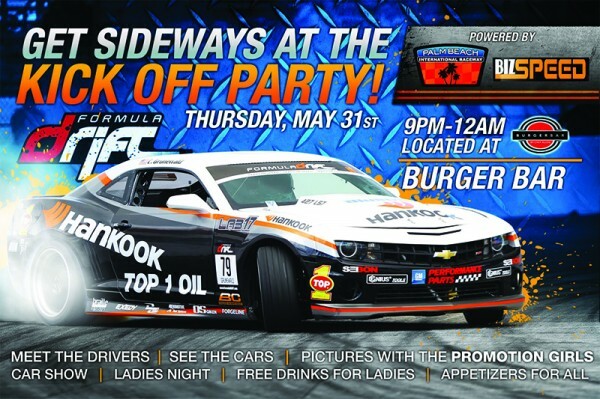 Come out to the Formula Drift Kick Off Party powered by BizSpeed at 9:00 p.m. on Thursday May 31st at Burger Bar in Palm Beach Gardens! This party will be an exclusive opportunity to meet professional drifters and see the cars racing that weekend. No other professional racing series showcases drivers of the highest caliber combining extreme car-control driving and tire-smoking power. This is the hottest drifting event to hit South Florida and your chance to party with the drifters and grid girl models, win tickets to the races and tons of free swag. It will also be Ladies’ Night at Burger Bar- ladies can enjoy complimentary drinks and food. In addition to the Formula Drift cars on display there will also be a car show showcased by BizSpeed and Slammed Society of Fatlace. In their relentless pursuit for speed BizSpeed and Palm Beach International Raceway are bringing the infectious rush of high adrenaline racing to the Formula Drift Kick Off Party. Don’t miss out an exclusive opportunity to meet and party with the drivers who will test metal against mettle that weekend. WHEN: Thursday May 31st 9:00 p.m. – 12:00 a.m.